L-R: Princeton YWCA CEO Judy Hutton, Hamilton Mayor Kelly Yaede, Director of Development Marty Flynn, and Young Wonders Hamilton Director Liza Zauner at a March 13 ribbon cutting marking the 45th anniversary of Young Wonders Child Development Center in Hamilton. Young Wonders Child Development Center Hamilton, which is now affiliated with the Princeton YWCA, is celebrating its 45th anniversary this year. Young Wonders, located on Nottingham Way, uses an award-winning, research-based curriculum that features exploration and discovery as a way of learning to help children develop confidence, creativity, and lifelong critical thinking skills. Young Wonders was established in 1972 and over the years has added all-day classes as well as before and after school care to provide working parents with a safe, nurturing family environment for their children. 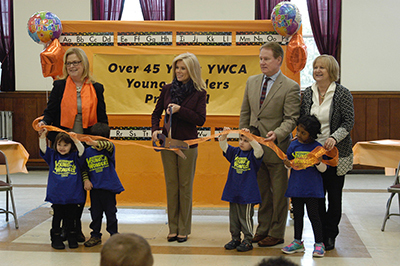 Hamilton Township Mayor Kelly Yaede joined Princeton YWCA CEO Judy Hutton, Young Wonders Hamilton Director Liza Zauner and Development Director Marty Flynn for a ribbon-cutting ceremony in March marking the school’s 45th anniversary.